First time I used it, was pretty dang exciting. 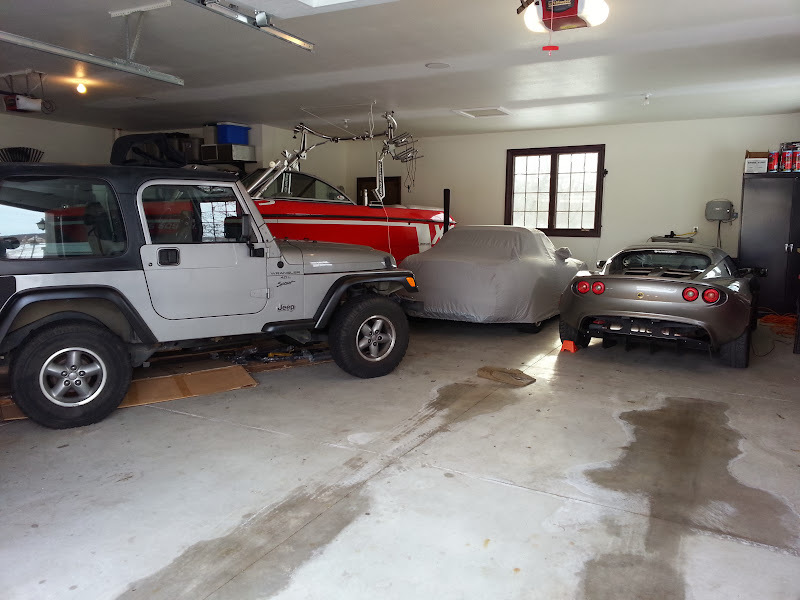 Technically the house was advertised as a 5 car garage, with a double door on one side and a single door on the other side, but is around 34' deep. Currently, has a Honda Ridgeline, Mastercraft X1, Jeep Wrangler, Honda S2000, Lotus Elise, and a Mercedes C300 all squeezed in. That sir is a BIG garage! Nice, now you need to do the floor and some art work on the walls. Not high enough! About 9`3"
Just changed the oil in the truck using the lift and was on my knees and still the entire time. Bout the only two cars that would fit is the lotus and s2000. I actually just now came in to take a break from cleaning the really old Bendpak I picked up recently. Seeing this thread makes me wish I would have just sprung for a new one. 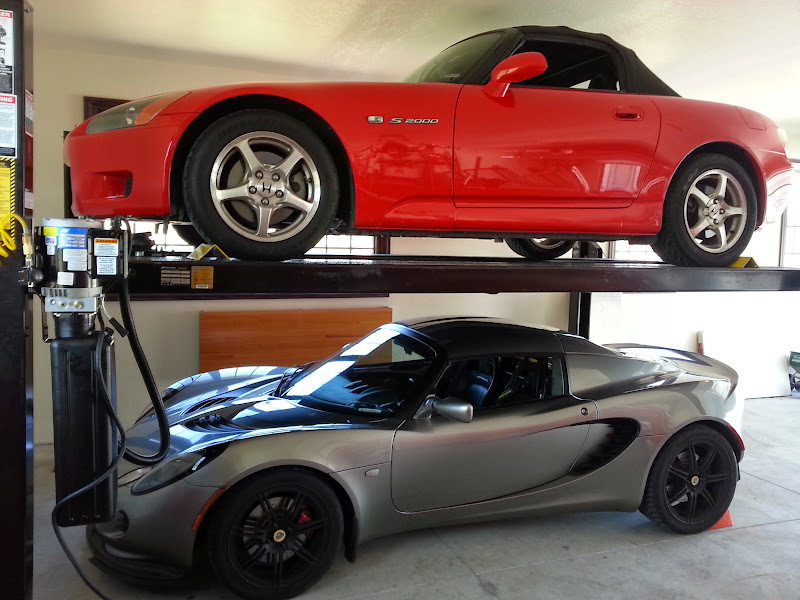 I have 9 1/2 in my garage, and I can have my Evora or my daughters Elise, pluses my 1965 E-Type on my two racks, my daughters new Miata also fits as well. 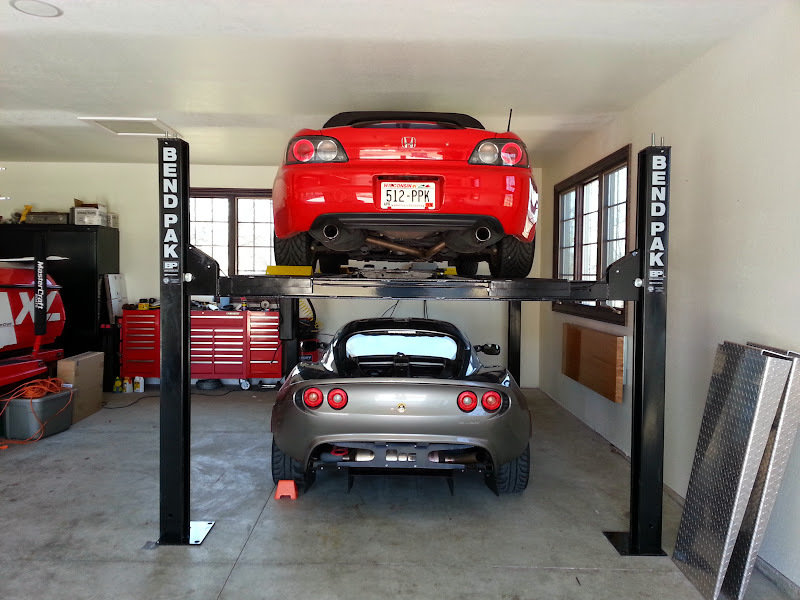 I can also have my Fiesta ST under the lift with her Elise on top. I have one of those garage chairs with wheels, that go up and down for working under my cars. It is way better than crouching over while standing. Love the S 2000 by the way. I am moving from my current house to a new house in about another month. It will sadly only have a 2 car garage-thus a lift being a must. I have all of Ron Avery's pictures saved (garage pics) , and that is my inspiration. In the next month or so, I am thinking of asking if I can come over and check out the floor and lift, RON? My current house, I did muscle gloss epoxy (blood red floor), and yellow walls. I want something a bit more different-sophisticated. Also as good as my red Epoxy garage looks, I can't work on it, due to it being so slippery. I too have a 07 AP2 S2000 (rio yellow). My AP1 S2000 (spa yellow), was stolen after I put 165k trouble free miles onit. How wide is the lift? 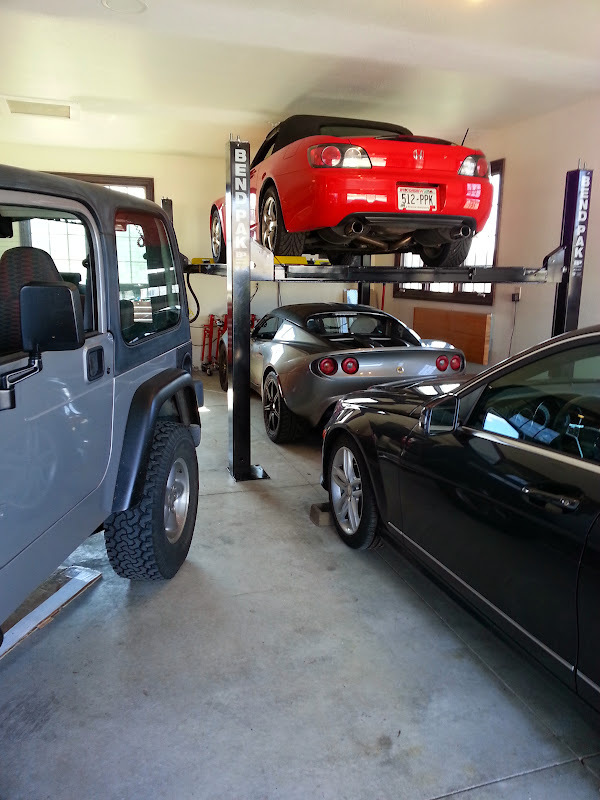 We have a 2 car garage and that would be perfect if it is not too wide that we can get her Liberty in next to it. [QUOTE=lotuscupcar;3060993]I am moving from my current house to a new house in about another month. It will sadly only have a 2 car garage-thus a lift being a must. No problem, I will pm you my phone #.